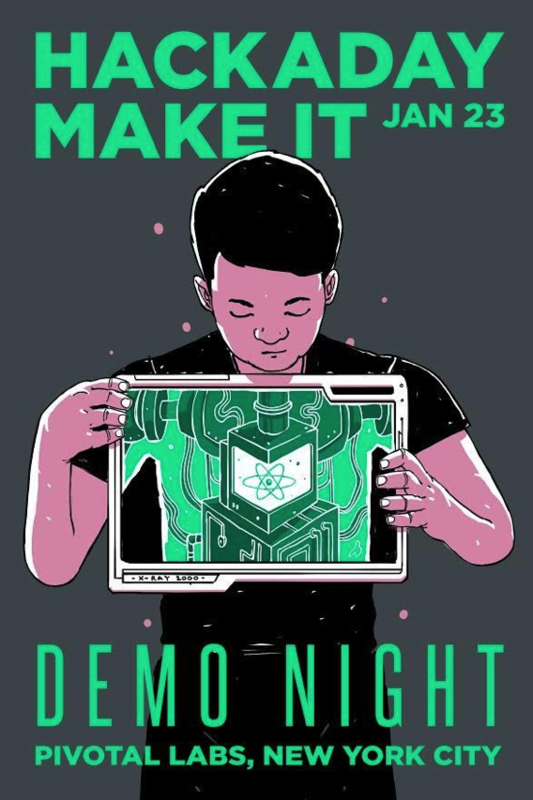 Hackaday NYC January: Demo Night! @hackaday @MakeItNYC @SophiKravitz @sgentiluomo « Adafruit Industries – Makers, hackers, artists, designers and engineers! Hackaday is having another meet up on January 23rd at Pivotal Labs – this time you can show of your project as well! There are still some demo spots open so make sure to submit if you would like to share. The meetup page is here and the general event page is here. No matter what your goals and plans are for the New Year, we encourage you to BUILD MORE COOL STUFF and then BRING IT TO HACKADAY NYC! We love to see what you’re working on! That’s why we’re kicking off our first Meetup of the New Year with a DEMO NIGHT on Monday, January 23rd! THERE’S STILL TIME TO SUBMIT YOUR DEMO! Whether you’ve recently made something awesome or if you have a favorite project from your past work, we invite you to share! If you’d like to participate, please reach out to Shayna and tell her about your project and if you have A/V needs. Makers will get at least 5 minutes to show-and-tell. We’ll try to showcase as many projects as time permits. We will also feature our open session of lightning talks. Please feel welcome to ping Shayna if you’d like to make a general announcement to the community. A sign-up sheet will also be available at the check-in desk on the night of the Meetup. Don’t forget to RSVP! See you on January 23rd!